With humble beginnings as an all-volunteer after-school program, PYO has since developed into five divisions serving nearly 500 students across a wide demographic in 20 counties in Pennsylvania, New Jersey, and Delaware. 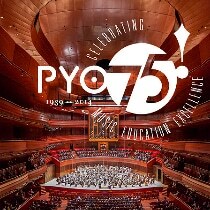 PYO's divisions include Philadelphia Youth Orchestra (PYO), Philadelphia Young Artists Orchestra (PYAO), Bravo Brass, Philadelphia Region Youth String Music (PRYSM), and Tune Up Philly. Many accomplished leaders in the orchestral field have been associated with the PYO program throughout its history, including master teachers, musicians, conductors, and famous alumni including Joseph Primavera, the esteemed former Music Director of PYO who served for more than 51 years; Sarah Chang, the world-class violinist; Christian McBride, American jazz bassist and PYO alumnus; Eric Owens, the renowned operatic bass-baritone and PYO alumnus; Francesca dePasquale, recent PYO alumnus and current teaching assistant to violinist Itzhak Perlman; and Grammy Award-winner and conductor Paavo Järvi, who served as an assistant conductor of PYO. There are also many esteemed Philadelphia Orchestra members who are PYO alumni, including Richard Amoroso (violin), Holly Blake (bassoon) Renard Edwards (viola), Mark Gigliotti (bassoon), Philip Kates (violin), Elizabeth Starr Masoudnia (oboe / English Horn), Margarita Csonka Montanaro (harp / retired), Shelley Showers (French horn), Booker Rowe (violin), Keri Ryan (viola), Peter Smith (oboe), and Burchard Tang (viola). Currently, the leadership of PYO is a most prestigious group of musicians and educators. Paul Bryan, Dean of Students at Curtis Institute of Music, serves as Director of Bravo Brass; Gloria dePasquale, cellist of The Philadelphia Orchestra is Director of PRYSM; Rosalind Erwin, who is also conductor of the Drexel University Orchestra, is the Director of PYAO; and the gifted composer/educator Paul Smith directs Tune Up Philly. Maestro Louis Scaglione is PYO's fifth and current Music Director, President, and CEO, who has transformed PYO into a nationally recognized, professionally managed institution. He has taken the PYO on many international concert tours. Destinations have included The 1998 World Youth Music Forum in Moscow; the Czech Republic and Italy (2000); China (2002); eastern and central Europe (2004); and a tour of Brazil (2007), where they performed to sold-out venues in São Paulo and Rio de Janeiro. A former member of the board of the League of American Orchestras, Maestro Scaglione was elected by his peers in 2006 to serve as Chairman of the Youth Orchestra Division Board.